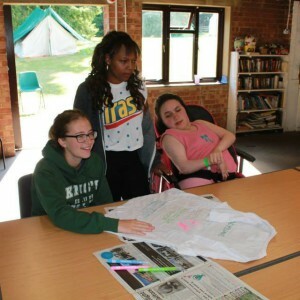 We want you to have a lovely time at Odyssians, so we thought you might like to read about what it might be like on your first day there. If you come to Odyssians, your first day might be different to this, but it will give you a good idea about how it might feel. If you have been to Odyssians, why not contact us to let us know how your first ever day was different? We hope you won’t feel too nervous about attending Odyssians camp, but if you are, you can let us know and we can talk things through with you. There will be many other new helpers at the camp; equally, there will be many people who have been helping at camps like Odyssians for years. They will be on hand to help and guide you as you learn the ropes. If you are at all unsure about anything, please ask. Remember that we were all new once, no matter how confident we may seem to you. Odyssians is at Woodlarks Campsite, which is in the south of England. You can come by car or by train. If you come by train, you can ride a bicycle or get a taxi from Farnham station: it’s 1.3 miles (2km), which costs about £6 in a taxi. Please don’t walk to camp, because our street, Tilford Road, has no safe way to walk. If you’re a volunteer helper, please arrive between 2:15pm and 3pm for training; if you need care for your disability, please arrive between 5pm and 6pm, by when we’ll have enough trained volunteers. 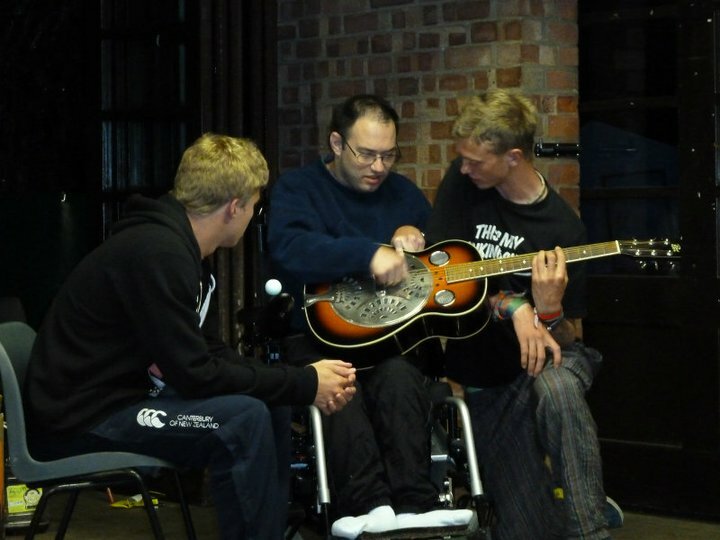 We usually have about 20 wheelchair users, 40 new helpers and 40 experienced helpers. If you arrive before 2pm (for volunteers) or 5pm (if you need care for your disability), please wait in the car park on the right just inside this entrance. When you get to the top of the hill, ask who will register your arrival. There might be time for a cup of tea or coffee for you and anyone who has brought you to camp, and there might be time for you to put up your tent, if you brought one with you. If you’re a volunteer, at about 3pm we’ll ask you to join us for training. We’ll teach you some basic things about how to work with people who have disabilities, and how to keep yourself safe and ask for help. You can ask us questions too, either when we are in a group or privately with a group leader. If you run out of things to do, please come back to the top of the driveway where we will give you something to do (or ask you to wait until everyone is ready). 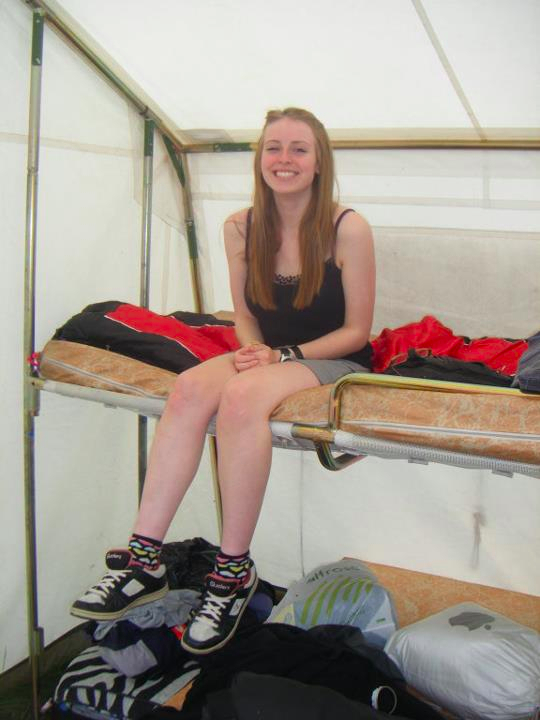 We have lots of orange mattresses (like the one Amy’s sitting on) which you can borrow for the week, even if you are sleeping in your own tent. This means you don’t need to bring your own sleeping mat. We also have blankets you can borrow to keep warm. We keep our mattresses in the ‘old dormitory’, just ask where this is, then go and pull one out for yourself and make your bed up in your tent. When you clear up at the end of the holiday, please put your mattress back for the next camp. 3. Meet your group leader. If your group leader is busy, you might meet another experienced helper first. You can ask our experienced helpers anything you like. You can talk together about what you feel comfortable and uncomfortable about, to help us work out who to partner you with. You might give or receive some medical information so you can understand what sort of help you will be giving or receiving. If you want to know more, or you want to say more about what you want, you can tell us at any time. If this is your first time working with volunteers, your golden rule is: please be patient. They might not be used to caring for others, and might not understand how you communicate at first. 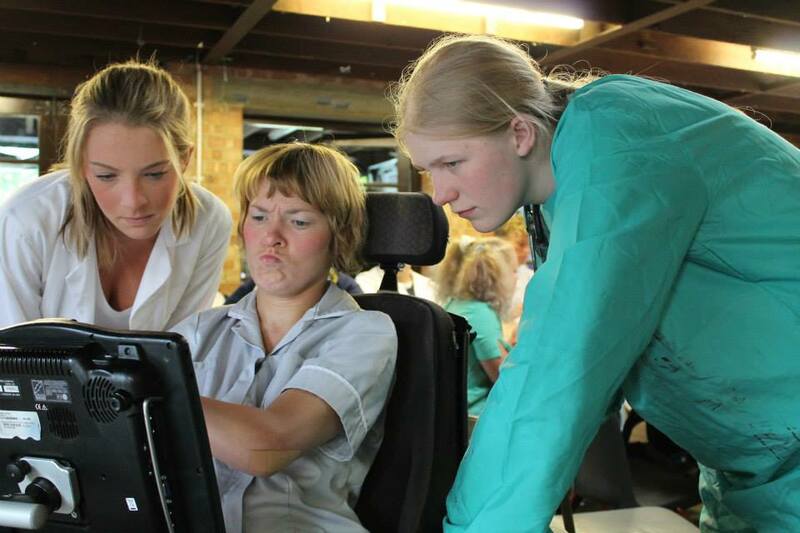 If it’s your first time working with disability, your golden rule is also: please be patient. If you want to find out how to do things, the best people to ask are the people who you are helping. You can also ask your fellow volunteers, but do take care with this: people who have disabilities are often offended if you ask others how to do things rather than asking them directly. If you have any medicine, or you are working with someone who has medicine, please find the camp nurse and store it with them, so that no-one can take it by mistake. Will you be working with specialist equipment, like hoist slings, wheelchairs, chargers, cups or spoons? If so, please either make sure it is clearly labelled with the owner’s name or take responsibility for making sure it doesn’t get lost right up until we pack away at the end of the week. At first, everything might feel disorganised until we decide who will sleep where. As soon as you do know, we recommend you get beds prepared well before sunset, because it’s easier to make beds in daylight. People who have limited mobility might need extra blankets too, especially if it’s a clear, cold night. If this affects your team, please ask where to get these. Once everyone’s settled, we’ll gather everyone together. There are some things we must tell you about, for example, how to keep safe around our swimming pool and kitchen. We will also eat our evening meal – this might be before or after our introductory talk. We might ask you to help someone else eat. If so, you might help people to cut their food up or maybe even put it in their mouths for them. Some people require their food to be very soft and a blender is available in the kitchen. If you’re feeding someone, please ask them how soft they need their food: some people cannot eat hard food. After dinner, we might play a simple game to help us get to know each other. On your first night, you might be working with new people, so it can take much longer than usual. We also encourage everyone to do as much for themselves as they can wherever possible, which can sometimes take longer than usual. So we suggest you start early so that you can take time to talk about how to do it as you go along, and taking breaks if you need them. If you want to stay up late but you need help getting into bed, please work with your team to decide who will help you get into bed. They will need to get some rest themselves, so you might have to go to bed earlier than you would really like. Similarly, if you’re supporting someone who needs help getting into bed who wants to stay up late but you want to go to sleep yourself, please support them to ask someone else who can help. If you get stuck, just ask one of our experienced helpers for support. If you stay up late, please remember that, on our campsite, noises you might think are quiet can sound really noisy to people trying to sleep in tents. At night, people in their tents will be able to hear your normal talking voice unless you are inside one of our buildings with the doors closed. So please use a whisper whenever you are outside or in a tent after 11pm and before 7.30am. You are welcome to stay up late and relax if you like, but we do expect everyone to be awake and ready to go at 7.30 the next day, so please do go to bed if you need to sleep. Each night, we arrange what we call a “night patrol” of two trusted volunteers who stay awake from 11pm until 7.30am. If you require night time care for your disability, our night patrol will visit your tent about every 30 minutes and shine their torch near your tent (so you can see it if you’re awake, but we hope so that it doesn’t wake you up if you’re asleep). If you need help, just say so. If you communicate silently, we can arrange to check discreetly that you are OK. 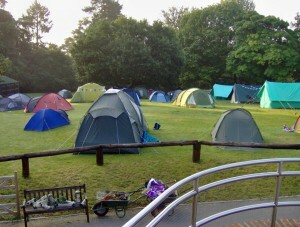 If you do not require night time care, we will not usually check your tent unless you ask us to. We will ring a bell, usually at 7.30, to wake you up. Sometimes, we will ask you to wake up at a different time. If this happens, we will try to tell you the night before. You must wake up at this time unless you have made a special arrangement with your team (for example, if you have been working late). On the first morning, you might take much longer than usual to get ready with your team, because you are not used to working with each other and you are in a new place. You might also have a different morning routine than usual. For example, if you normally have a shower when you get up, it might be better for you to shower later in the day because our showers are sometimes busy in the morning. Talk about this with your team to work out what’s OK for everyone. 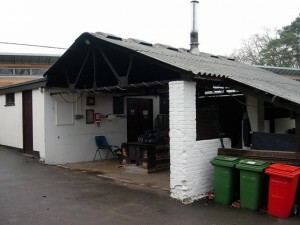 Here are some photos of our toilets and showers. This is a shower bed. It has a soft, waterproof mattress and an electric hoist in the ceiling above, so you can easily get onto it from a wheelchair. This toilet has lots of hand grips to help you get on and off, and to help you keep yourself upright while you use it. 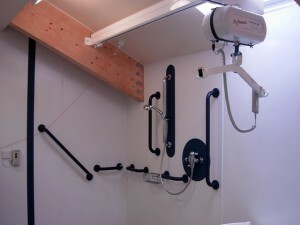 Some of our toilets also have electric hoists in the ceiling above, to help you transfer to and from wheelchairs. We might also ask you to help someone else eat, although if you did that last night then we might ask someone else to take their turn. Here is a picture of Robin cooking some sausages. 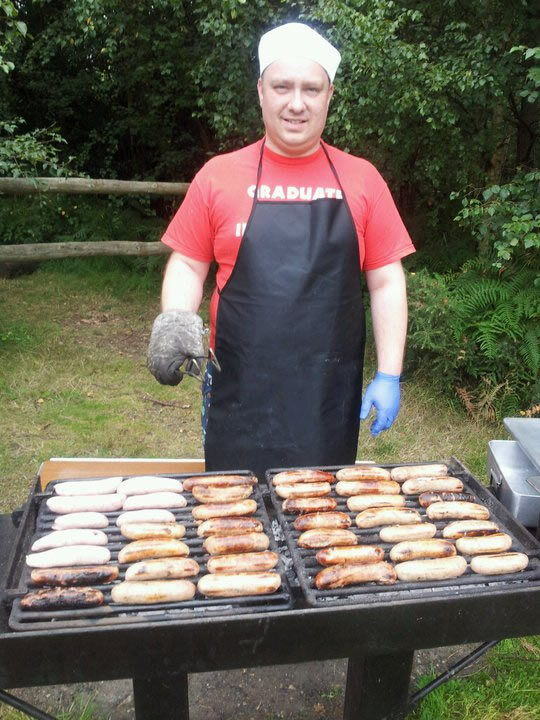 If you don’t eat meat, Robin will probably cook a meat-free sausage (or something else which you can eat). After breakfast, we ask everyone to do small jobs. This might be washing up, fetching wood for the kitchen fire or recycling. Your group leader will help you work out what to do. We might ask you to work together with someone who has different mobility to you. This might take you longer than normal because you have to work out how to do things together. c. Socialising, like playing cards in a group of mixed abilities and disabilities. If you volunteer, we can work with you to give you more of the kind of work you enjoy; we can also support you so that you can get better and enjoy the other kinds of work too. Here is a photo of Bex and Millie being sociable together. It’s really important to us to balance hard work with your need to rest, and we recognise that you might get rest in different ways to other people. 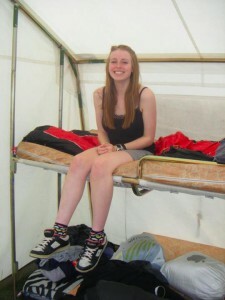 For example, you might stay up late socialising, or you might prefer to spend time alone in your tent during the day. We rely on you to help keep camp running, so if you stay up very late socialising, we don’t normally allow you to take lots of time off the following day as well. Please talk with your group leader about what sort of rest time you need the most. 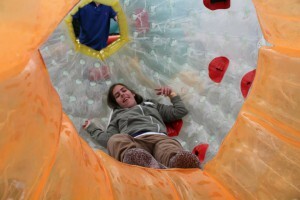 Some people who come to Odyssians have very limited mobility. Lots of us use wheelchairs and we might need help to support our bodies to move from our wheelchairs to the swimming pool, beds or toilets. If you’re a volunteer, we might ask you to help move someone. Lifting someone should not hurt you, but it can be dangerous to you and the person you are lifting if you do it wrong. So we give you an introduction to lifting and handling techniques on your first day. Please ask for help at any time if you are not sure how to do it. We have special electric hoists to lift people, including hoists which work in some of our tents: please use these wherever possible. Never lift anyone on your own or if we haven’t trained you yet. Lifting someone with help from at least one other person is always safer than lifting on your own. Woodlarks has a range of gender-neutral washing facilities to suit all needs. We have baths and wheel-in showers. 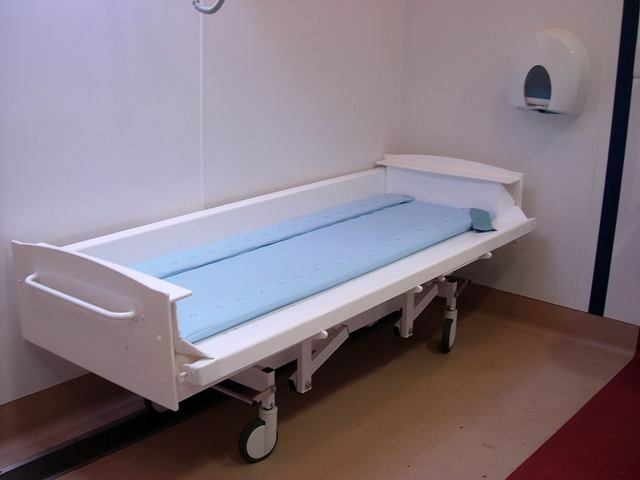 However, there is not always space to transfer someone from a wheelchair onto a special shower chair or bath cubicle, so you we also have special showerproof wheelchairs to take you there. Please always make sure you and your team members are appropriately covered with a dressing gown or towels before you go out into public spaces. Remember shower wheelchairs have a hole in the middle of the part you sit on, so use towels to keep warm and protect everyone’s dignity. 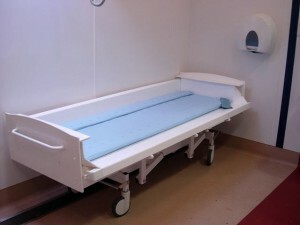 We have an indoor sleeping area which has a hoist to lift people right through from bed to bathroom. If you use this, remember the dignity of the person using the hoist as well as the other people in the bedroom. If you are helping to wash someone, it is important that the person being cared for feels comfortable. Talk to your camper and ask them if they can wash themselves or are there areas they need help with. If they can, offer to give them a flannel so they can do it themselves. If they can’t, let them decide if they’re comfortable with you doing it for them. 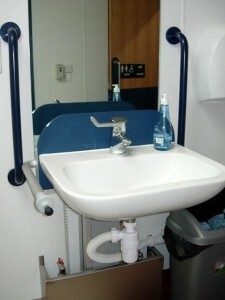 If you are helping someone wash or use the toilet, we ask you to have a third person there too. They can check everyone is comfortable and help out if needed. The only exception is if there is if someone needs urgent help and there is no-one available. If this happens, please ask a third person to join you as soon as possible and tell your group leader about what happened. 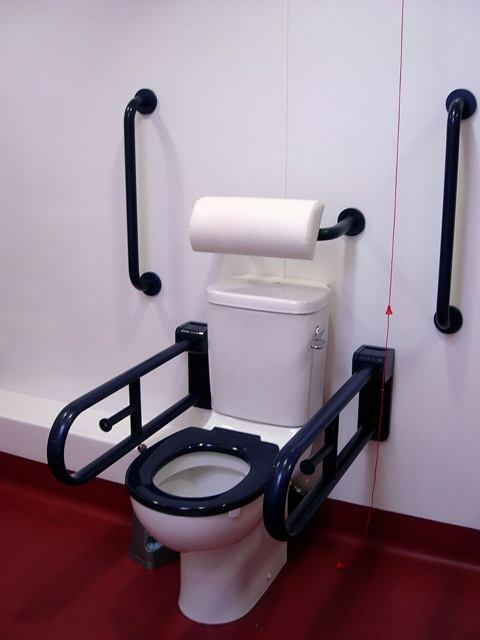 We have several gender-neutral toilets to suit a variety of mobility needs. Lots of people are nervous about taking someone else go to the toilet for the first time. If you are one of them, talk to your group leader: they can explore with you why you feel nervous and help you think about what to do. Each of us will need help in a different way, so it is important to ask how we wish to be helped. Some of us can clean ourselves but others of us will need help. For some of us, we need someone to position and hold a bottle while we pee. Remember to seek help and advice when helping someone go to the toilet, particularly if you are nervous or if it is the first time. As always, the best person to ask is usually the person receiving care. If you’re helping someone who can use the toilet on their own, please don’t automatically stand in the cubicle waiting for them to finish. Instead, offer to wait outside or ask if you can go and get a cup of tea and come back later to see if they have finished. Take care when entering or leaving the toilet cubicle that you don’t expose anyone unnecessarily. When taking someone else to the toilet, it is more important than normal to keep good hygiene. We have protective gloves in several sizes. Please wear these for both you and your camper’s safety and comfort. Please also wash your hands when you finish, even if you wore protective gloves. Like washing, please make sure there is a third person there whenever you take someone to the toilet. The extra person can check everyone is comfortable and help out if needed. Here are some of the other things you will learn about during your week with us. If you’re unsure about any of these, please ask your group leader. That’s it! After your first 24 hours, we hope you’ll start to feel settled in and enjoy some of our activities. Your group leader and our experienced Odyssians will all be happy to work with you to help you get the most out of your week. 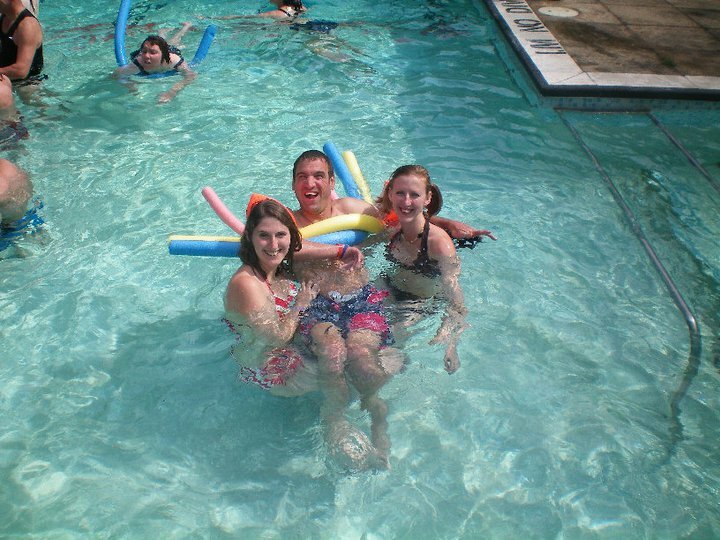 We hope this story has helped you understand what it’s like at Odyssians. We wrote it with help from lots of people who have been before. You don’t have to learn about specific disabilities, but, if you’re interested, you might want to learn more about the disabilities som of our friends at Odyssians might have, for example, cerebral palsy or spina bifida, or less-visible disabilities like learning disabilities. If you’d like us to add something or change something, why not let us know? [email protected]. What next? 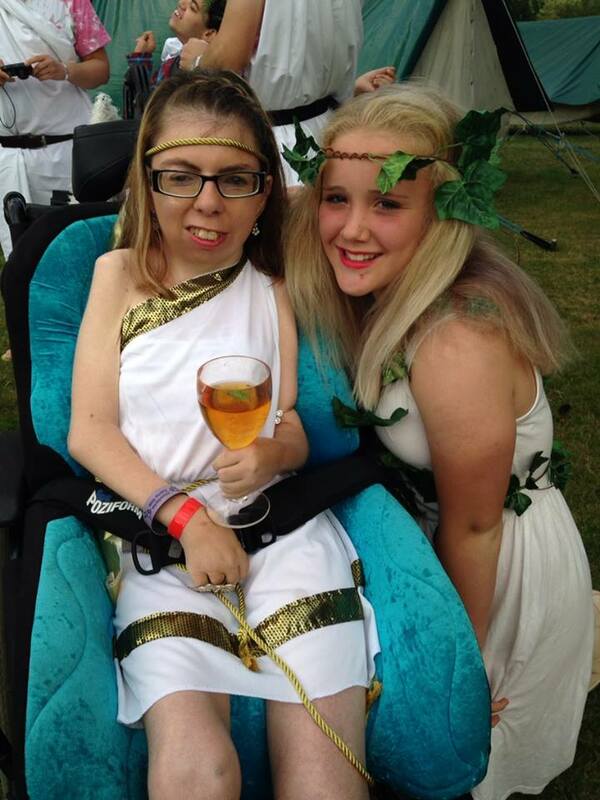 Why not check out some more of our photos or apply to join us next summer?